Who’s in the mood for a treat? 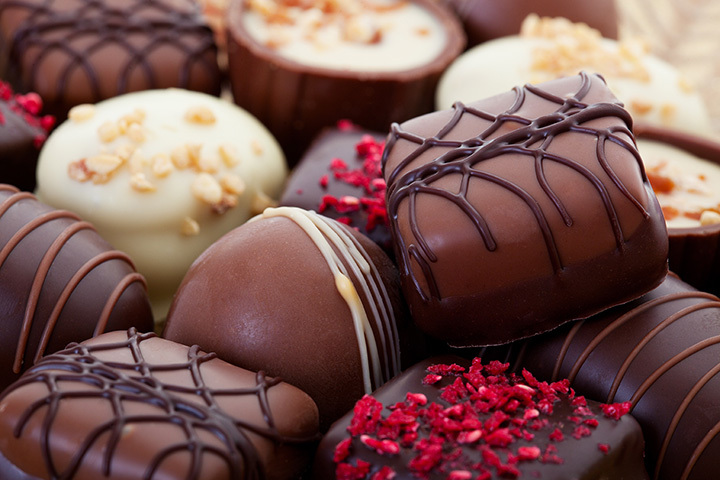 The delicious chocolate shops of Michigan are sure to satisfy any chocolate lover’s sweet tooth. From coconut clusters to assorted caramels to classic fudge, these places will send you straight to chocolatey heaven. Here are our favorite shops in the state. Grand Rapids' Mokaya, from its inception, was eager to make a name for itself in chocolate in a city world-renowned for its beer. It manages to do that nicely by not only offering chocolate, but also offering beer that, in many cases, incorporates chocolate. Check out the Elk Coffee Porter dark chocolate or the Grand Rapids Brewing Co. Rosalynn Bliss white chocolate. If you'd rather have your chocolate unadulterated, no problem; try the truffles, which range from maple cream to Thai basil black pepper. Or just settle in with a Mokaya candy bar and go about it that way. One of the sweetest parts of a trip to Jackson is a stop at Gilbert's Chocolates. A Chocolate of the Month Club can start you down the path, and when you get a handle on what you like, buy it directly. Seasonal boxes, Michigan history boxes, and more await you here, as well as the “Gilbert Chocolates Surprise Box,” a subscription package that comes with either fudge or a four-piece chocolate set as well as four other items sent monthly. Birmingham Chocolate, much as the name suggests, is a big deal for chocolate in Birmingham. That's clear from the name, but it gets better when you look at what's actually there. Customization is a focal point of this operation, as you can not only build your own box, but also your own bar. Boxes can include a range of clusters and truffles, along with nifty extras like toasted coconut and salted caramel. The bars, meanwhile, will open up a range of ingredients like cashews and mangoes to add to your candy bar. Sayklly's is an Escanaba institution, and actually had an appearance on the Food Network show “Unwrapped” for its Whopper Snappie. The Whopper Snappie boasts nuts, fresh-roasted, along with homemade caramel and a layer of its own, in-house, premium chocolate. That's how Escanaba got the Food Network to go tramping around Yooperland, so you know it's good stuff. Plenty of other breeds are on hand, like peanut clusters and caramels. But if you want something simpler...and bigger...check out the 10-pound Sayklly's chocolate bar. You'll find Alpine Chocolat Haus locations throughout Michigan, specifically Gaylord, Sault Ste. Marie, Plymouth and Boyne City. The diffuse nature of the shop won't affect the offerings any, though, as you'll be able to get fudge and boxed chocolates right here. They also dip a surprising number of things in chocolate, including both pretzels and potato chips. And if you like the caramel apple, wait until you try the chocolate apple. They've got several kinds waiting at Alpine Chocolat Haus. Head to Lansing to check out Fabiano's Candies, a store that offers up the full range of chocolatey bliss. Try out the standard fare, like creams and clusters and truffles, that have made chocolate lovers' day for decades. If you want to go beyond that, though, there's plenty here for you too. A chocolate-coated graham cracker, for example, or almond bark, or even dried fruit like blueberries, cherries, and cranberries are all waiting for you here. If you'd like something sweet that isn't chocolate, they've got a range of penny candy options here too. Kilwin's in Petoskey—among other places—has been a major part of Northern Michigan life since the 1940s, and when it comes to chocolate, it still focuses on making chocolate, fudge, and ice cream in much the same way. Dipping chocolate is a big deal here, as they'll chocolate-coat not only pretzels and marshmallows, but also Rice Krispie treats (fitting, since they originated in Michigan too), Oreos and even Twinkies. Fresh Coast Chocolate Company is a company that carries out the construction of chocolate “from bean to bar.” They start with hand-sorted beans and carry out a multi-stage process that results in some of the best chocolate around. It's worked well, too—the company has eight products, and as of this writing, every one is sold out, so keep an eye on Fresh Coast to get some really impressive global chocolate. Kalamazoo is the longtime home of Heilman's, which offers not only chocolates, but also fresh-roasted nuts and a range of gift packs. The real draw is the creeper, which is Heilman's own twist on the classic turtle treat. Pecans, caramel and chocolate come together to make this treat a winner. Mixed chocolates are also available in half-pound, pound, and two-pound sizes, with creams, truffles, cordials and more awaiting. If you're looking for something unusual, Heilman's offers a chocolate-coated pretzel that uses pretzel rods instead of the ordinary pretzel. A comparatively new entry, The Candy Coop in Constantine specializes in two things: fudge and local flavor. The fudge is regarded with an almost surprising regularity as being some of the best fudge around, which isn't exactly hard given its location. The fudge is just for starters, though, as the company also offers a range of candy—like chocolate-covered cherries—and balloons to round out its profile. Best of all, though, it's also seen routinely at area events and offering its own, handing out candy for Halloween or as part of a baby shower.